Paleochora (pop. 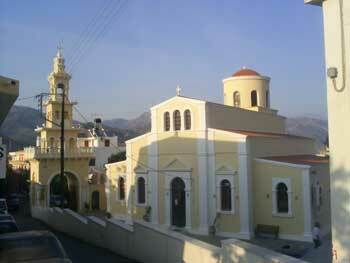 3000) is the main town in the South West of Crete. Like many places, Paleochora was discovered in the 1960s by hippies, and has since developed into a tourist resort. Paleochora itself is situated on a peninsula. You’ll find two beaches in town, one to the east, and one to the west. In the south, you’ll find an interesting Venetian castle built in the 13th century. Unlike many towns in Crete, Paleochora has not fallen to the temptation to build ugly concrete hotels, leaving the town with a pleasing aspect. Another nice village with a long beach not far away by ferry is Sougia. Most tourists here are from Germany and Austria. 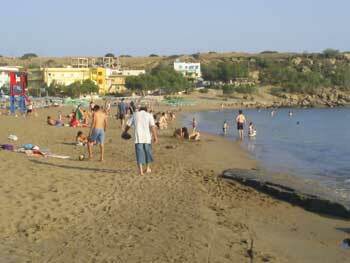 There are tourists throughout the year here, as in Ierapetra, even in winter. Should you feel lonely travelling Crete in the winter months, why not visit Paleochora to meet some nice people? The split between package tourists and backpackers here is 50:50. The airport at Chania is two hours away, and so not as many package tourists come this far as one might expect. In my opinion, Paleochora is worth a visit for two or three days, but probably not interesting enough to stay for an entire holiday. For many, Paleochora is a good place to catch ferries for the many beaches nearby. Three to five buses run daily between Chania and Paleochora – in season there is a daily early morning bus up to Omalos (Samaria Gorge). The boat sails a couple of times daily to Sougia and Agia Roumeli (the end point of Samaria Gorge). Most days in summer you can catch a small ferry to Elafonisi, and once/twice a week down to Gavdos. When I was last in Paleochora I stayed in pension ‘Anonymous’ – one of the cheapest rooms you can find in Crete. In spring 2008 there were rooms going for less than €20. Anonymous is also a meeting point for backpackers in Paleochora. Paleochora also has an average campsite, some ten minutes walk out of town.